1948 - Purchased first pump and supplies, 6 lengths of hose. 1951 - Purchased 1946 Chevrolet truck to mount pumper ($465), built up first pump on truck ($1,291.56). Purchased lot for fire house from Edmund Halfmann ($200). 1952 - Purchased set of air packs. 1954 - Incorporated Calumet Volunteer Fire Department. 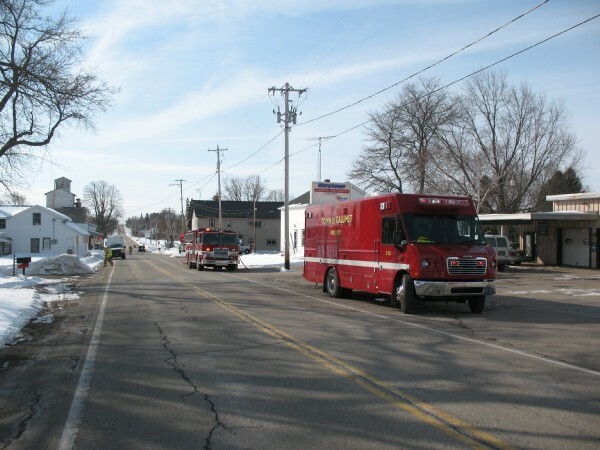 Met with Town of Calumet officials in regard to building a new fire station. 1955 - Built new fire station, purchased 1948 Ford water tanker ($665), build-up at Pierce Mfg. on 1948 water tanker ($500). 1957 - Purchased 2-way radios. 1961 - Purchased 1961 Ford pumper truck ($5,150), built up 1961 truck ($9,398). 1962 - Department size now requires two groups. 1963 - Started ambulance service with van ($2,345), build-up ($1,214), radio ($350). 1964 - Started social gathering with Mt. 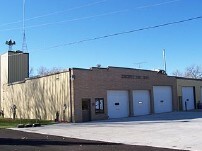 Calvary Fire Department. 1965 - Purchased new water truck. 1969 - Receivers were installed in firemen's homes. 1970 - Purchased 2nd water truck. 1972 - Installed fire conference in 10 homes and fire station. 1974 - Installed loading station at Columbia Park. 1976 - Purchased new front mount pump - 1975 Dodge. 1978 - Discontinued ambulance service. 1979 - First quick dump added to water tank; insulated ceiling in fire station. 1980 - Received 30 pocket pagers ($261.32 each), added quick dumps to 2nd water truck; started taking CPR courses; purchased van ($1,700); sold old ambulance for $1,350. 1981 - New pumper arrived (Total Cost $74,000: Truck $25,200, Build-up $48,800); added cascade system; developed new protection contracts - now on assessed valuation ($.03/$100), Town of Taycheedah was $10,000, now at $26,700. 1982 - Beginning of 911 Emergency phone system. 1983 - Mutual agreement put in place with all fire departments in Fond du Lac and Calumet County. 1984 - Installed dry hydrant at Benders; began using relay system with 4" hose. 1985 - Installed first high-band radio; sold water tanks used in pick-up trucks; new Insurance Services Offer rating (ISO). 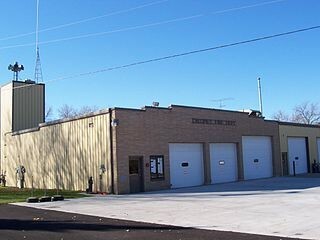 1986 - Building committee met for addition to fire station. 1987 - Building in progress, with addition to communications room and mechanic's room. 1988 - Updated 350 supply van to 1982 step van including latest equipment ($75,000 value), department's cost of about $20,000 because build up was done by firemen. 1989 - Sold old van ($1,400); Wisconsin Power & Light donated Ford truck to be used as water tanker, rebuilt by firemen ($23,050); sold old 353 tanker ($7,000). 1990 - Purchased Pipe Auction Center, formerly Edmund Halfmann's garage and first "home" of the fire department; started to order all new helmets, coats, bunker pants, boots and gloves to outfit firemen according to National Fire Protection Association standards. 1991 - First Responders formerly organized. 1992 - Discussion began on constructing a training tower; installed all new high-band radios in trucks and base ($12,230). 1993 - Built training tower. 1994 - Put 352 water tanker into service. 1995 - Purchased computer system for all fire department records. 1996 - Purchased two wet suits for cold water rescue ($1,600). Purchased 351 pumper; fire department contributed $55,000 for chassis. 1997 - New 351 pumper was put into service, replacing the 1961 pumper truck. 1998 - Purchased cold water rescue sled. 1999 - Purchased new turnout gear and thermal imaging camera. 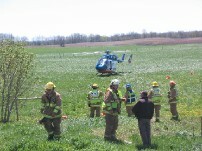 Installed dry hydrant at Hansen's Pond. 2001 - Installed air exchange system in firehouse. Purchased new 354 mini-pumper for $141,000 replacing a 1975 Dodge. 2002 - Purchased 12 defibrillators. 2004 - Purchased washing machine for turnout gear and 18 handheld radios. Replaced 353. 2005 - Purchased new helmets and started build-up for new 350. 2006 - Purchased new 350 for $219,280 to replace 1982 step van. Extrication equipment acquired. 2007 - Upgraded SCBA (self-contained breathing apparatus), small generator and lighting. Upgrade to concrete approach and asphalt parking lot. 2008 - New truck radios and 20 handheld radios bought. Laptop and crash recovery program bought. 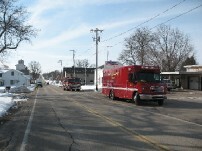 2009 - Members participate in formation of the Calumet County Dive Team. Active participation in formation of MABAS. 2010 - New 351 put into service and replaced a 1981 truck at a cost of $397,000. 2nd thermal imaging camera bought. 2011 - SCBA masks acquired for each firefighter.